According to New York City’s IBO, in 2012, there were actually 5 times more moves to Florida than to adjacent Connecticut. However when breaking the movers into 2 categories: households with real income below and above $500,000, the results really change. New York, New Jersey and Connecticut enjoyed a large increase of high income movers from New York City. The California market share in this category of movers collapsed. 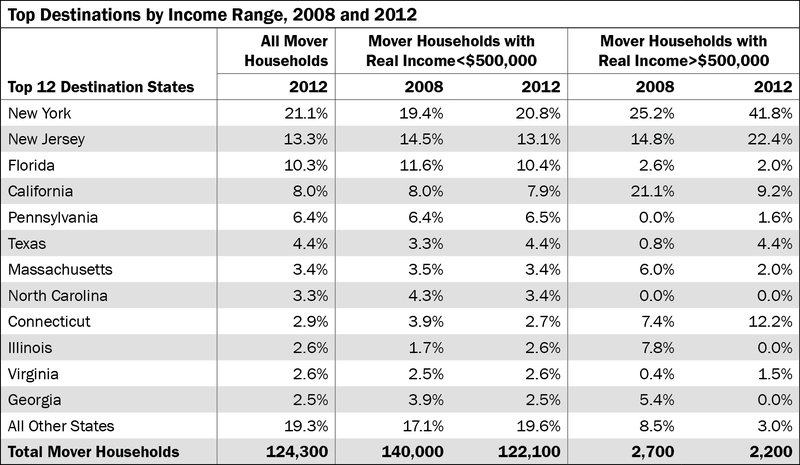 But it is important to recognize that the high wage earners only represent 1.8% of total movers. Florida is still the third most popular destination for movers from NYC who are mere mortals. The Federal Reserve Bank of New York uses a coincident index to track the New York, New Jersey and New York City economies. Our Indexes of Coincident Economic Indicators (CEI) for January show economic activity expanded at a brisk pace in New York State and New York City, but was essentially flat in New Jersey. This report is provided by Jeffrey Otteau of the Otteau Appraisal Group who also authors a series of widely followed quarterly market reports on the New Jersey real estate market. This information is collected from various sources including Boards of Realtors and Multiple Listing Systems in New Jersey. I have known Jeff for many years and consider him one of the leaders in the real estate appraisal profession. He has taught me a lot about quantitative real estate market analysis. April home sales increased from the March pace for the first time since 2005 in what may be a sign that market stabilization has begun. In April, New Jersey contract-sales activity increased for the 4th consecutive month and recorded a 9.3% increase above the March level. By comparison, sales activity declined during April in both 2006 and 2007. Also significant is that number of homes for sale rose modestly as Unsold Inventory increased by only 4.5%, less than normal for the month of April. As a result of these trends the Projected Absorption of homes offered for sale now stands at it’s lowest level of the year reflecting a 10.0 month supply. By comparison, absorption stood at 12.7 months in January, 11.0 in February and 10.5 in March. Any determination as to whether these trends actually signal the beginning of a market recovery hinges on the momentum carrying through for the remainder of the 2008. There are ,however, a growing list of positive factors for the housing market which include increased housing affordability due to lower home prices, favorably low mortgage interest rates and massive pent-up demand due to reduced purchase activity. To keep things in the proper perspective however, it is clear that the housing market remains in the grip of a dramatic correction and will not see rising prices until Unsold Inventory levels have been reduced significantly. Until then home prices will likely drift slightly lower, although at a slower pace than the past 2 years. But a bottom to the housing downturn may be forming which would be a first step towards recovery. Potential home buyers who have been delaying their purchase in an attempt to ‘time the market’ should consider whether that time has now come. This is because the greater risk in delaying is the likelihood of higher mortgage rates in the future due to the inflationary pressures of high oil and food prices which will erase any potential savings from future price declines. Supporting this view is recent remarks by Federal Reserve Chairman Ben Bernanke indicating that future interest rate cuts are not likely due to a need to guard against inflation. Our analysis of the cost-benefit relationship of delaying a home purchase indicates that the added monthly cost attributable to rising interest rates is likely to be greater than the savings generated by any further price declines. Thus, the next 6 months will present a rare combination of low interest rates, low home pricing and a wide selection of homes being offered by motivated sellers. We’re all likely to look back five years from now and conclude that 2008 was a time when Smart Buyers took advantage of this unique opportunity by locking in both low prices and low interest rates. I’m reminded of the axiom that the right time to sell is when everyone else is buying, and the right time to buy is when everyone else is selling. February home sales turned in another weak performance erasing hopes of a housing market recovery any time soon. Following a disappointing January when contract-sales were off by 30%, February home sales were down by 21% compared to the same month last year. This leaves year-to-date contract-sales activity 25% below last year at this time, making it the worst start for home sales since the housing recession began in 2005. Further evidence of market weakness can be found in Unsold Inventory levels which rose for the 2nd consecutive month to 65,000 standing homes on the market, excluding the pipeline of new construction homes not yet completed. All of this provides compelling evidence that falling home prices will continue for the time being. As a reference point there were fewer than 32,000 homes for sale back in 2005 when home prices were last appreciating, suggesting that unsold inventory will need to decline significantly before home prices start rising again. Our current projection is that home prices will not recover to 2005 peak levels until 2015 at the earliest. Therefore, the advice to home sellers is to Right! Price before home prices decline further. This is because overpricing extends marketing time, leading to a lower selling price down the road. Despite the ongoing market decline however, some brighter spots exist in the housing market. Housing demand continues to outperform the overall market in downtown redevelopment areas as well as in communities offering transit rail access. Look for this trend to intensify as transit rich communities offer tangible solutions to New Jersey’s housing affordability constraints, particularly as younger Generation-Y home buyers transition from renting to home ownership over the next 5 years. Switching to the buyer’s perspective, the current housing market presents a unique opportunity by way of falling home prices AND low mortgage interest rates. Because the decline in home prices typically slows later in a correction cycle, the greater risk in timing the market is the potential for higher mortgage rates ahead. Thus 2008 will provide home buyers with the double bonus of lower mortgage rates and lower home prices. Also noteworthy are the increased Jumbo mortgage thresholds for loans in excess of $417,000, which are scheduled to expire at the end of this year. This, together with tax refunds later this year increase the likelihood of higher interest rates and borrowing costs in 2009. Therefore, we’re likely to look back 5 years from now and conclude that 2008 was the ‘sweet spot’ for home buying. The pace of home sales in New Jersey declined further in December providing compelling evidence that the housing market recession has not yet reached bottom. In December, Contract-Sales activity declined 24% below the November pace and was 31% less than in December 2006. When considered against the backdrop of high Unsold Inventory levels and a looming economic recession, it appears certain that existing-home prices will continue their decline into 2008. As a result, strategies of ‘waiting until Spring’ are ill conceived as overpricing inevitably leads to extended marketing times and lower prevailing market price levels. Best-Practices for a weakening housing market is to price ‘ahead of the decline curve’ to shorten marketing time and capture a higher selling price before prices drift even lower. From the new construction persepective however, many home builders have already embraced this strategy with Right Pricing! that reflects the current market realities. For the next segment on our Right Pricing! Strategy, register to attend our 2008 Spring Workshop Series next month. Despite the ongoing market decline, some bright spots are emerging. Unsold Inventory declined for the fourth consecutive month and now stands 16% lower than in August, reflecting 12,000 fewer homes on the market. Also encouraging is that mortgage interest rates continue their descent providing a boost to home buyers’ purchasing power and helping to close the housing affordability gap in New Jersey. According to Freddie Mac’s latest Primary Mortgage Market SurveyÂ® (PMMSÂ®), the 30-year fixed-rate mortgage averaged 5.48 percent for the week ending January 24, 2008, down from 5.69 percent the prior week and 6.25 percent last year at this time. The last time mortgage rates were lower was March 25, 2004, a time when home buying activity was at a frenzied pace. Another positive factor is yesterday’s announcement that President Bush and House leaders have agreed on an economic stimulus package that would allow Fannie Mae and Freddie Mac to raise the limit on the loans they purchase from $417,000 to $625,500. Similarly the FHA limit would be increased from $362,000 to $725,000. The effect of such increases would be to expand the pool of money for borrowers of so-called Jumbo Mortgages thus increasing liquidity and reducing interest rates for these loans in the process. The take-away from all of these developments is that while the market has further to fall, the bottom point is getting closer. Home buyers should take notice of these developments as 2008 presents an unusual combination of being in the ‘driver’s seat’ of price negotiations at a time of record low interest rates. Those who wait too long will eventually find this opportunity window closed when higher interest rates and firmer pricing returns to the market. UPDATE: Here’s more commentary on the New Jersey market. The slowing pace of home sales continued in November as Contract-Sales fell to the lowest level since the housing recession began in 2005 and ran 18% below the prior month’s pace. Also noteworthy is that Unsold Inventory fell for the 3rd straight month and now stands at 64,000 homes, as compared to 72,000 in August. While this inventory reduction would otherwise be a positive sign for the housing market, the current reduction is driven by weak market performance leading would-be sellers to defer their selling plans until Spring and also causing home builders to further slow the pace of new construction. Thus, the continuing decline in Unsold Inventory provides further evidence that the bottom of the current housing recession has not yet arrived. As a result the ongoing decline in home prices will extend into 2008, suggesting that ‘waiting until Spring’ is an unwise decision for home sellers hoping to maximize selling price. Given that home prices continue to decline and that the pace of future price increases will be slow and gradual once the housing recovery begins, home prices are unlikely to recover to 2005 levels until Spring of 2014. As a result, Right Pricing! to current market levels is the smart strategy for sellers. For the next segment on our Right Pricing! Strategy, register to attend our 2008 Spring Workshop Series coming soon. Switching to the buyer’s perspective, Spring 2008 will present a unique opportunity that has never before occurred in the housing market,namely lower home prices AND low mortgage interest rates. This is because home purchase activity is traditionally tied to interest rate levels such that low interest rates typically increase sales pace and prices while reducing Unsold Inventory. The next 6 months will therefore present a rare combination of low interest rates, lower homes pricing and a wide selection of homes being offered by motivated sellers. We’re all likely to look back five years from now and conclude that 2008 was a time when Smart Buyers took advantage of this unique opportunity by locking in both low prices and low interest rates. I’m reminded of the axiom that the right to sell is when everyone else is buying, and the right time to buy is when everyone else is selling. The decline in the housing market which began during the 2nd half of 2005 is evidenced by the rising tide of unsold homes on the market. While there are many contributing factors, the supply of competing properties is paramount as it creates a ‘mood of the market’ which determines whether home buyers feel any sense of urgency. For example, as Unsold Inventory declines and a buyer’s choices diminish they are inclined to purchase sooner rather than later driving inventory even lower and home prices higher in the process. Conversely, rising inventory extends normal marketing time causing home sellers to reduce their asking price. In this rising tide environment home buyers adopt a ‘wait & see’ stance due to concern about falling home prices, leading to further increases in Unsold Inventory and thus creating a downward spiral. Any reverse of this cycle is then predicated upon a decline in Unsold Inventory. While this is admittedly a simplistic view which does not take into account corresponding demand factors, the bottom line is that the housing market can not improve significantly until Unsold Inventory declines. And the first step toward inventory decline is for it to stop rising. The New Jersey housing market provided a glimmer of hope in July as Unsold Inventory declined for the first time since January. That this decline accounted for less than a 1% reduction in Unsold Inventory makes it clear that the housing recession is far from over and will continue into 2008. However, should inventory hold at its present level would signal the ‘beginning of the end’ for the housing recession. The July housing market also saw an increase in contract-sales activity on a seasonally adjusted basis. As demonstrated in the NEW JERSEY CONTRACT-SALES ACTIVITY chart, July sales were higher than one year ago confirming that while the housing market is weak it still has life. No surprise here as despite the decline in sales activity over the past 2 years the underlying demand for housing is still bubbling beneath the surface. This is because life goes on with continuing household formation, marriages, the birth of children, job promotions, divorce and retirement all leading to changing housing needs which translates into housing demand. Thus, the stage is being set for a rebound in the housing market once the current challenges sort themselves out. From a market absorption perspective, the Unsold Inventory presently reflects a 9.0 month inventory of homes as compared to 8.9 months in June. This however compares to a 4.0 month supply in July 2005 suggesting that inventory is currently about double where it needs to be before home prices will start rising again. This is important to would-be home sellers who are considering waiting things out before selling their present homes as any rise in home prices is likely several years off. The results of our latest analysis indicate that contract-sales activity declined by 5% in June, continuing a pattern of inconsistent sales pace. Following 3 consecutive months of increasing sales activity in January, February and March, sales declined in April, then increased in May, only to decline again in June. This uneven performance is evidence that the market has yet to regain its balance and continues to struggle with the effects of diminished affordability following the unprecedented home price increases that occurred between 1992 and 2005. From an inventory perspective, while the number of unsold homes continued to rise in June, that increase occurred at a slower pace than in the 4 preceding months. Unsold Inventory increased in June by only 1% suggesting that inventory growth may be approaching the high-water mark. Statewide Unsold Inventory now represents an 8.5 month supply, as compared to 8.1 months in May and 7.7 months one year ago. Despite this uneven performance, there are emerging signs that the housing market may be nearing the bottom of its current recession which began in September 2005. The most compelling evidence is based upon submarket trends in northeastern New Jersey that are within commuting range of Manhattan. In these markets, which include the counties of Bergen, Essex, Hudson, Middlesex, Monmouth, Morris, Somerset and Union, contract sales declined by only 1.7% from May to June (as compared to 5% statewide) and actually ran higher than the June 2006 level. Most notable in this group is Hudson County where year-to-date sales activity is running 12% ahead of last year. 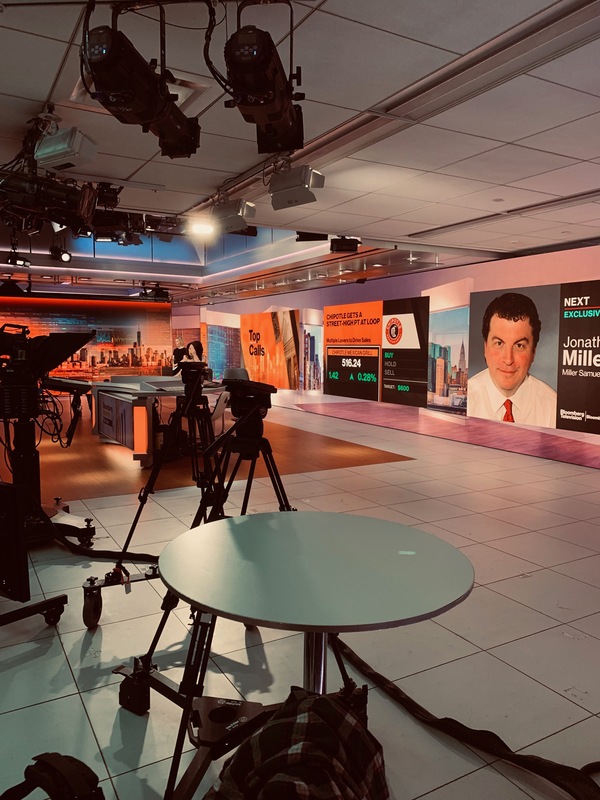 The stronger market conditions in northeastern New Jersey serve as a reminder that the strength of the Manhattan real estate market, which continues to experience strong demand levels, is generating overflow demand to nearby suburban locations. Expect this to be a long term trend as communities near to direct Manhattan rail access will see the strongest price increases once the market recovers. Looking ahead the housing market still faces significant challenges as sales pace will likely slow during the approaching fall and winter seasons. Given this probability, home prices will be challenged to hold at current levels considering there are presently more than 72,000 homes for sale in New Jersey as compared to only 39,000 in June 2005. This monthly market report is provided by Jeffrey Otteau of the Otteau Appraisal Group who also authors a series of widely followed quarterly market reports on the New Jersey real estate market. This information is collected from various sources including Boards of Realtors and Multiple Listing Systems in New Jersey. Following 3 consecutive months of rebounding sales activity, the New Jersey housing market down-shifted in March to a slower pace raising concerns about the much anticipated spring selling season. Of particular concern is the market’s ability to absorb record high unsold inventory levels in the face of weakening demand. Prior to this slowdown, the housing market was enjoying increasing sales activity due largely to gains in housing affordability resulting from a market correction in 2006 which caused a slight decline in home prices . Other reasons for the rebound include lower mortgage interest rates and a strong job market that drove salaries higher. As a result, housing became more affordable by the end of 2006 and sales activity rebounded. That rebound has now stalled due to the ripple effects of Sub-prime mortgage delinquencies, which for the most part is a misunderstood topic. Most of the confusion stems from counting the number of foreclosures, which is being overstated in most media reporting. Don’t get me wrong – this is a serious problem that will continue to worsen between now and the end of 2008! But to date the actual pass-through rate of foreclosures into the housing supply has been minimal. For example, the national pace of actual foreclosures has been running around 22,000 per month while the reported figures have been 125,000 per month. Similarly, it was widely reported that national foreclosures topped 1.2 million in 2006 while the actual number was less than 1/5 of that. The New Jersey figures are similarly overstated with actual foreclosures averaging about 200 homes monthly as compared to reports of nearly 5,000 per month. The error lies in the standard counting methods which include both actual foreclosures as well as all home mortgages that are in some stage of delinquency. And to make things worse, some of the same homes are being counted multiple times as they pass through various stages of the foreclosure process. Given that only a small percentage of delinquent loans actually reach the final stage of foreclosure, the reported figures are not what they appear to be. To put this into perspective, consider that there were 270 foreclosures in New Jersey during the month of March against a backdrop of 70,000 homes on the market. In that context, foreclosures have thus far been insignificant in terms of any real effect on housing supply. However, concerns about the depth of this problem have translated into slower home sales due to widespread misreporting of the facts. In New Jersey, it was widely reported that there were 4,780 foreclosures in March when the actual number was 270. Another wrinkle resulting from the Sub-Prime issue is that mortgage lenders have begun tightening their loan approval standards in order to limit the number of new high-risk loan originations. This tightening has had the effect of either increasing the required minimum down payment ..or.. Increasing the monthly mortgage payment, which in turn reverses the gains in housing affordability realized last year. This is rapidly developing into a watershed issue as it transfers to all home price segments in the housing market. This is due to the fact that first-home purchase activity generates ripple effects all the way up to the luxury home market due to the trade-up activity it generates. Or more importantly, a decline in first-home purchase activity makes it less likely that luxury priced home can be sold. And last but not least, the concerns about the implications of the Sub-prime problem are causing home buyers to rethink whether or not now is the right time to buy. That the current slowdown is occurring at a time when mortgage rates are at 40-year lows, home prices have declined, employment is at record high levels and an expanding economy is continuing to create new jobs reminds us that public-perception usually translates into market-reality housing. At this point, the big question is whether the surge in sales activity that normally occurs in a spring market has been lost or delayed. Best indications are that there will be a 2nd leg to the spring market that will occur in late May and June as the basics of affordability, pent-up demand and possible interest rate cuts eventually take control. Supporting this scenario is the declining frequency of negative new stories concerning the both the overall housing market and Sub-prime foreclosures, as well as the significantly reduced pace of new construction starts which will result in less housing inventory. However, history has taught us that public perception can become a self-fulfilling prophecy given enough duration in time. So, it seems that the market is once again in a ‘wait & see’ position. Stay tuned for our next eNewsletter release later this month updating the housing market. In the most positive sign for the New Jersey housing market in more than a year, contract-sales activity in December moved into positive territory for the 1st time since August 2005. In December, contract-sales activity ran 2% higher than December 2005 providing solid evidence that home buyers are beginning to reenter the housing market in response to lower home prices and continued low mortgage interest rates. The December performance follows lesser improvements in year-on-year home sales in October and November, and marks the first time in 16 months that the housing market experienced a higher volume of monthly sales activity than the prior year. A more sobering view however comes from Unsold Inventory which actually increased in December by 1% or about 800 homes. While this increase is not significant from a statistical perspective, it does send a clear message that greater increases in home sale activity will be needed to reduce current inventory levels and restore balance to the housing market. At the December sales pace, Unsold Inventory represents a 10.6 month supply which far exceeds the balance point at which home prices will rise. By comparison, there was a 7.8 month supply one year ago. Therefore, while recent market improvements may signal the end of the housing decline, it should not yet be interpreted as a return to higher prices. Also keep in mind that these improvements have been fueled primarily by lower home prices suggesting that Right-Pricing! remains the key to successful home marketing.